Sit back and Relax and let Be-Com Computers correct your infected computer. Viruses and Spyware can make your computer freeze, crash, behave strangely and plague you with those annoying pop-up ads. Our Computer technicians can remove problems from your infected computer either over the Internet, or coming to your home or work place. Our experts will detect and eliminate every deeply rooted infection and get your computer back up and running as fast as possible. 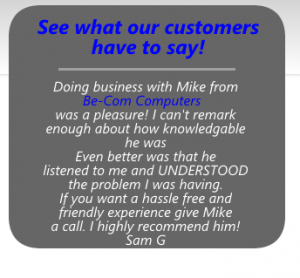 At Be-Com Computers we are always here to help, in every way we can.